One of the best things about working in a custom framing shop is seeing the wide variety of artwork out there in the world. Some of it is truly beautiful while other items are fascinating for their own reasons –like a painting we framed a few weeks ago. One of our clients, lawyer Trevor Todd, travelled to North Korea with First Steps -a charity group dedicated to feeding that country’s malnourished children and its nursing and pregnant mothers. Recently Todd returned from the DPRK with a few souvenirs of his travels there. He brought in a couple of oil paintings on canvas for us to stretch and frame. My favorite painting from this batch depicts a young boy in perhaps his father’s big furry winter hat. 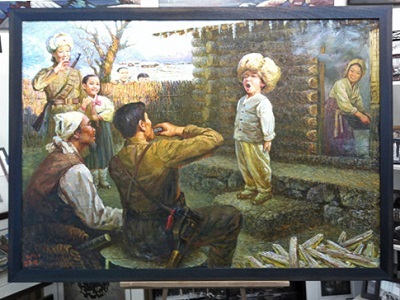 He is standing soldier straight and singing some patriotic song about the fatherland, we assume –while his father plays the harmonica and his mother, uncle, sister and neighbours all look on admiringly. Everyone is smiling. Everyone is happy. The message is clear. 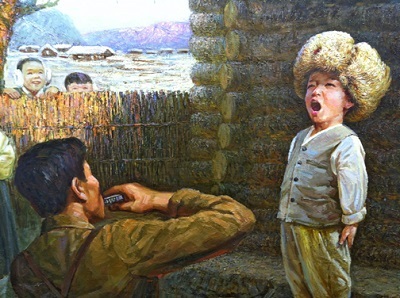 The painting may be a depiction of a young Kim Jong-Il who was, as North Korean state mythology tells us, born in a log cabin during the fight against Japanese oppression in the 1940s. It’s a style of painting known as socialist realism –and it is alive and well in North Korea. In fact, it is the only style of artwork allowed in that county. Every piece of art serves the purpose of glorifying the state, educating the population or demonizing the enemy. There is no such thing as an abstract painting in North Korea. In fact, abstract or conceptual art is forbidden and artists must stick to subjects and themes approved by the state. The goal of this style is to depict people as they ‘truly’ are in everyday scenes. Since the common worker is the centre of Communist ideology, the life of the worker is the only subject matter permissible. All art work in North Korea –whether it’s a painting, TV show, movie, ballet or opera, music or propaganda serves to glorify North Korean life –or its leader. Socialist realism started with Stalin’s Soviet Union and was then copied by Mao’s China and now exists only in a couple of places like North Korea, Laos and Vietnam. To get to see one of these pieces up close is one of the benefits of working in a custom framing shop. Although the painting itself is what we would call an original, the subject itself has probably been copied many times over. Artists in North Korea regularly make copies of famous masterpieces. The strange and sad thing about this painting is that in reality, probably the only smiling people in all of North Korea are the ones in this painting. And given the widespread grinding poverty of most of the population there, its hard to tell if the rural log cabin scene is from the 1940s or from today. And did you know that the dear leader, Kim Jung-il, played his first round of golf and shot 38-under par –bagging 5 holes-in-one that day? No joke. North Korean state media reported that the former leader regularly shot 3 or 4 holes-in-one every time he played. And at 5-foot 3-inches tall, that’s quite an accomplishment. The truth is, after all, stranger than fiction. To learn more about Trevor Todd’s trip to North Korea, visit his website and read the blog post here.